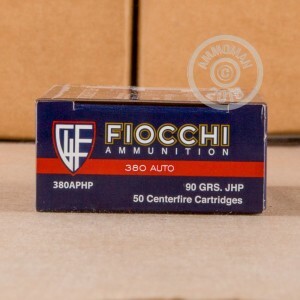 This cost-effective .380 ACP ammunition from Fiocchi can be used for both self-defense and target shooting. These rounds fire hollow point bullets, which expand on contact with a target and provide much more stopping power than full metal jacket rounds. They also punch cleaner holes in paper than their FMJ cousins, though whether this is worth the slightly higher cost is a matter of personal preference! Each cartridge in this box of 50 fires a 90 grain jacketed hollow point bullet at a muzzle velocity of 975 feet per second, producing typical ballistics for the .380 Auto. In compact pistols, this can still result in quite a kick so it's best to grab a few hundred rounds and get some practice in. AmmoMan.com can help too with free shipping on all orders over $99! 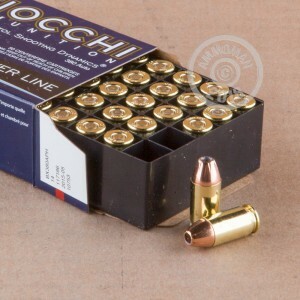 Fiocchi ammunition uses non-corrosive Boxer primers and brass cases. 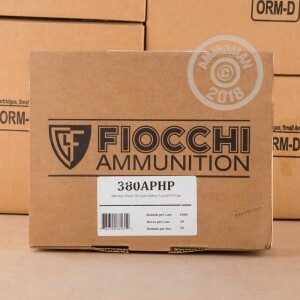 Most of their ammo sold in the US is also loaded domestically at Fiocchi of America in Ozark, Missouri; some is also imported from the company's global headquarters in Lecco, Italy (which also services NATO-area defense contracts). Wherever it's made, Fiocchi ammo is cost-effective and reliable.